It is an alternative universe obsessed with alternate universes. In this reality, Japan has been divided by the Soviet occupation of Hokkaido since 1974. As far south as Tokyo, people can see the Ezo Tower stretching into the stratosphere. 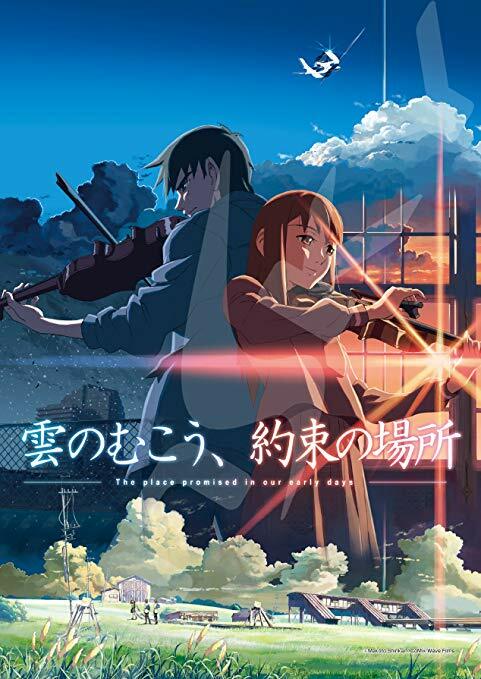 Most of the Japanese and their American allies assume (rightly) that it is a weapon, but its awesomeness as a sight to behold takes on a very different meaning for three teenagers in Makoto Shinkai’s first feature, The Place Promised in Our Early Years, which screens as part of the Metrograph’s weekend Shinkai retrospective. Hiroki Fujisawa and Takuya Shirakawa are so fascinated by the Tower, they are converting an old drone into a two-seater aircraft, so they can take an up-close-and-personal look-see. Their classmate Sayuri Sawatari is fascinated by their fascination. For a while, they are like Jeanne Moreau and the two title characters in Jules and Jim, until Sayuri mysteriously disappears. Soon thereafter, the boys go their separate ways for high school. Fujisawa lands an internship at a top-secret research facility funded by the NSA that is studying the Ezo Tower. According to current intelligence, it is indeed a form of weapon that pulls in matter from the dozen or so alternate universes that Japanese scientists have identified. Eventually, Fujisawa’s boss Prof. Tomizawa learns the missing Sawatari has fallen into a catatonic state, because she has some sort of connection to the Tower. It turns out her grandfather in her divided family was responsible for its construction. He didn’t do her any favors, because her consciousness is now trapped in a lifeless alternate universe. Despite the mild dystopian elements, it is easy to see thematic kinship between this film and Shinkai’s blockbuster hit, Your Name. Frankly, there is a good deal of mind-bending science fiction in the earlier Early Years that we would not have minded seeing Shinkai develop in greater depth. However, his primary concern is the relationships of his three central characters, which truly pay off handsomely. Fujisawa, Shirakawa, and Sawatari are all believable teens, but some Shinkai’s supporting characters are even more intriguing. This is especially true of the secretly rebellious Tomizawa and the gruff but protective Okabe, the lads’ former boss at the munitions factory, who also happens to be the leader of the hawkish unification resistance. This is a compelling hybrid of sf and romance, but what really defines the film are the striking visuals rendered by Shinkai (and “co-director” Yoshio Suzuki). Shinkai makes the Earth look unearthly, while still retaining a feeling of the familiar. This is a prime example of why Japanese animation is so well-respected among serious connoisseurs and casual fans alike. It is a gorgeous film, but it also has brains and a romantic soul. Highly recommended, The Place Promised in Our Early Years screens tomorrow (8/11) as part of the Metrograph’s Shinkai series, along with the very nice Children Who Chase Lost Voices and the instant classic Your Name returns for a week-long run.